Cyclesnack: XC with a Full Face? Is there a new fad in the mountain biking community to do XC riding with a full face helmet? I saw two guys at Pequonnock River Valley on Sunday wearing full face helmets and little else, besides shorts and a t-shirt of course. Like this one guy on a Trek Hardtail who I came across once in the Bastone area while speaking with a guy on a nice groovy colored, old school Klein Hardtail, and again in the ledges. They other guy just cleaned the big up-and-over by Coyote Crossing as I was admiring some woman's pooch that was a cross between Basset Hound and a German Shepard. It looked like Corgi on 'roids. 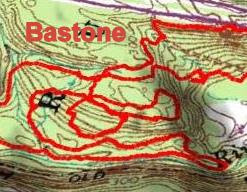 I think I have finally found my bread and butter ride for P-Valley, especially for riding in the maze of trails that I call Bastone, because it reminds me of the episode in Band of Brothers where they are holding the line in the Arden Forest just outside the village of Bastone. It's a flattened area with a lot of scrub cedars and little trails. Cool slick rock abounds and there are some cool, little rollers interspersed here and there. The route is around 8 miles and takes advantage of all the tough climbs and brings you by some great features to play on. It also follows the flowiest trails where you can really hammer. Once the Trumbull Trails Coalition fixes the other descent on the red trail that meets the yellow trail by the jeep road I will start going that way, too because I hate hike-a-bike, fall line climbs. I did about 8 miles in 2.5 hours but I spent time chatting up a few park users. My last visit to P-Valley was somewhat painful after crashing in Bat Cave Jr so I stayed away from that feature and tried to keep the ride primarily XC. Realing from the crash two weeks ago I decided to where pads but they were largely unnecessary because I didn't ride any features. Something is up with my Reba as well. The fork will no longer lockout. Looks like I might have to get it fixed but it served it's purpose. It made my descents all that much faster when racing this summer, at least at Massasoit and Domnarski Farm. The new EBB on Dillinger is working nicely. It creaks a little bit but I can live with that compared to cacophony of squeaks and creaks that I had before. I love the anodized purple but apparently Soul Cycles doesn't do the rest of the bits in purple so when they get more, I will have to get red one. Of course, if things work out the way I hope they will, that might not be necessary. I still need to offset the harshness of aluminum with some cold, hard steel. My search for a good, in expensive frame hasn't produced any good options as of yet but I still have my eye out for deal.